Virat Kohli, AB de Villiers scored a half-century each as Royal Challengers Bangalore (RCB) register their first win of the Indian Premier League 2019 (IPL 2019). RCB defeated Kings XI Punjab (KXIP) at Mohali by eight wickets to open their account on the IPL 2019 points table. Set a target of 174 runs to win, RCB completed it in 19.2 overs with de Villiers finishing unbeaten on 59 off just 38 balls. No End to Funny RCB Memes Despite Virat Kohli and Co’s First Win of the IPL 2019. Parthiv Patel and Kohli started off positively and added 43 for the opening wicket in quick time. Soon after Patel’s dismissal, De Villiers and Kohli joined hands to post 85-run stand for the second wicket. The valuable partnership made sure RCB get closer to the target and first win of the year. Kohli was eventually dismissed in the 16th over. The RCB skipper scored 67 off 53 balls and smashed eight fours during his stay. After the match, Kohli expressed happiness and said, “Great feeling to get across the line. Have been unlucky in couple of games. Won't say we've been unlucky in every game, but a couple of games we should've closed out before this. After so many setbacks, the guys had desire. 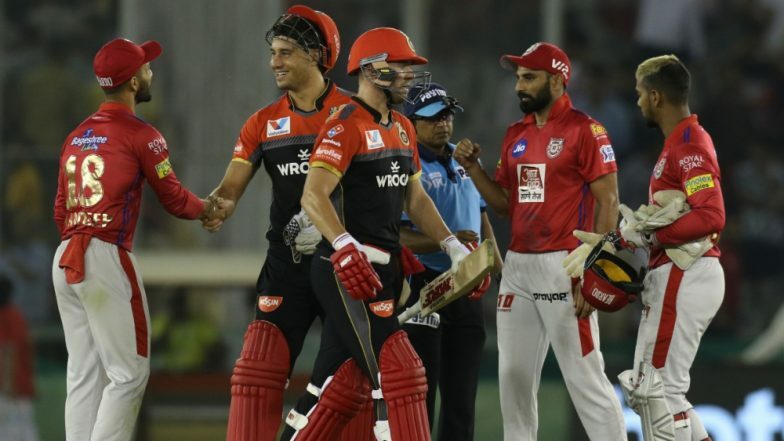 That's one word we spoke about.” KXIP vs RCB Highlights IPL 2019: Royal Challengers Bangalore Register First Win of the Season. # Virat Kohli and AB de Villiers now hold the record of adding most runs as a pair in IPL, going past 2787 runs added by Chris Gayle and Kohli. # Virat Kohli now holds the record of scoring most runs by an Indian in T20s, going past Suresh Raina's tally of 8145 runs. # Chris Gayle is the second player after Suresh Raina to remain unbeaten on 99 in IPL. # Chris Gayle is the first player to score 100 fifty-plus scores in T20 cricket. Earlier, put to bat first, Kings XI Punjab managed 173 for four in their allotted 20 overs. Opener Chris Gayle finished unbeaten on 99 runs. Apart from him, no other KXIP batsman got going and 18 was the second highest. Gayle smashes ten fours and five sixes during his stay in the middle.